Fedor Emelianenko returned to Japan on New Year's Eve and earned an easy first-round knockout victory, leveling the Olympic judo gold medalist Satoshi Ishii with a right-left-right combination that ended the fight quickly. 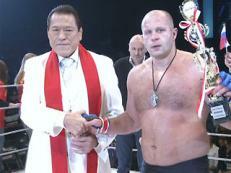 Fedor's performance in the main event at the Dream New Year's Eve show at the Saitama Super Arena in Japan was impressive, but it also showed just how mediocre a fighter Ishii is: His striking and stand-up defense are extremely rudimentary, and he just wasn't ready for an opponent of Fedor's level. The two had a good exchange in the early going that started with Fedor throwing a kick, Ishii catching it and going for a takedown, a brief clinch and ultimately Fedor knocking Ishii down, and after that it was all Fedor: The Last Emperor had settled in and gotten comfortable, and then he was going to win handily. For Fedor, who left Strikeforce on a three-fight losing streak this summer, the win over Ishii was his second in a row, having previously beaten Jeff Monson by decision. Fedor is no longer fighting high-quality competition, but he is winning again. -- Shinya Aoki defended his Dream lightweight title with a one-sided unanimous decision victory over Satoru Kitaoka. Aoki wasn't able to finish the fight despite repeatedly getting dominant positions on the ground, but he won this fight handily. -- Hiroyuki Takaya won an easy decision over Takeshi "Lion" Inoue in the Dream featherweight title fight. Inoue simply looked like he didn't come to fight, as Takaya repeatedly battered him with punches, and Inoue spent most of the 25-minute affair backing away. -- Bibiano Fernandes won two fights to take the Dream bantamweight title, first defeating Rodolfo Marques by unanimous decision in the semifinal bout, then beating up Antonio Banuelos by first-round TKO in the final. Fernandes looked great, and he may just be the best bantamweight outside the UFC. -- Tatsuya Kawajiri looked very good in his featherweight fight with Kazuyuki Miyata, winning with an arm-triangle choke in the second round. Kawajiri is now 2-0 since dropping to featherweight. -- Megumi Fujii, one of the best female fighters in the world, did exactly what everyone expected her to do: She made short work of the overmatched Karla Benitez, winning with an arm bar in the first round. -- In a highly entertaining mixed-rules match, Katsunori Kikuno defeated Yuichiro Nagashima with a second-round TKO. Kikuno battered Nagashima in the first round of the fight, which used kickboxing rules, and then finished him off on the ground in the second round of the fight, which used MMA rules.